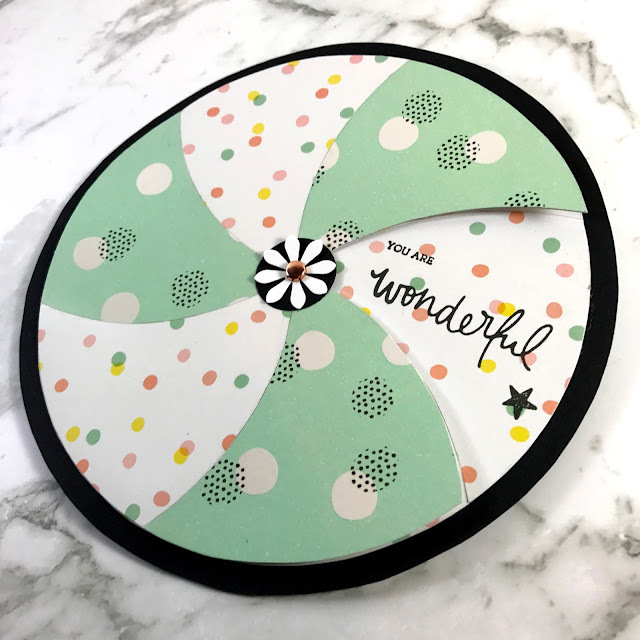 To make this spinning card you need two wheels, one with an opening (I will refer to this as the 'top wheel') and a wheel with all the sentiments (I will refer to this as the base wheel). 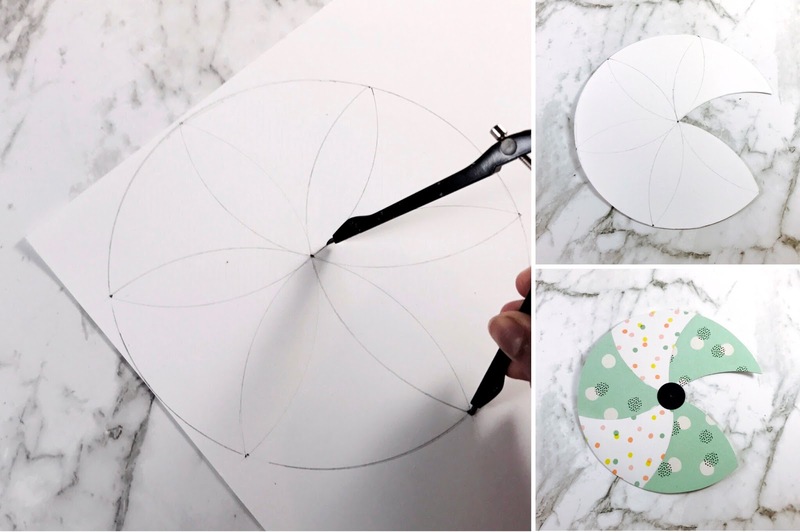 I used three sheets of patterned paper from the pad, two of which were the same pattern and then I cut them down to circles with a diameter of 6 1/2 inches (used a compass to draw the circles). I also used a white piece of cardstock cut down to 6 1/2 inch diameter circle for the top wheel and used a black piece of cardstock and cut out a 7 inch diameter circle for the base wheel of the spinner (you can definitely make a smaller version of this and use circle dies to make the circle cutting process easier). To create the six segments on the top wheel place the tip of the compass on the edge of the circle and draw a curve that goes through the centre of the circle to the edges, then move the compass to the point where the line crosses the edge and draw a curve through the centre again. Repeat until you form a six petal flower. 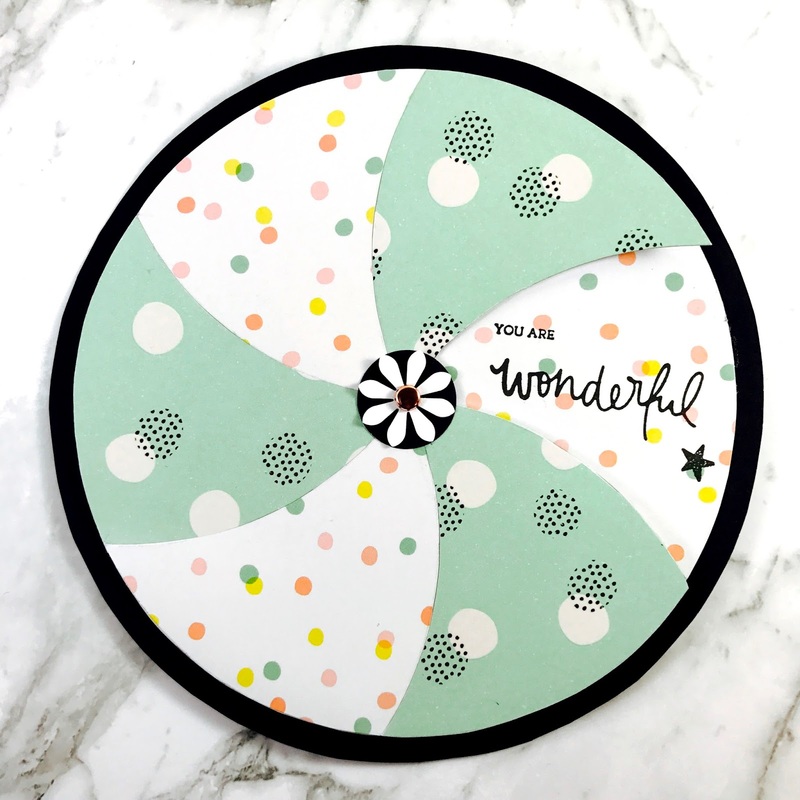 Do this for the patterned paper circles too. Then you will need to cut out a segment from the white cardstock circle as shown in the image above, this will be where the sentiment will be visible. Now cut out all the segments for the patterned paper and stick alternating patterned paper segments as shown in the image above. Add a small circle to the centre of the top wheel, this will allow us to connect the two wheels by adding a brad through the centre. 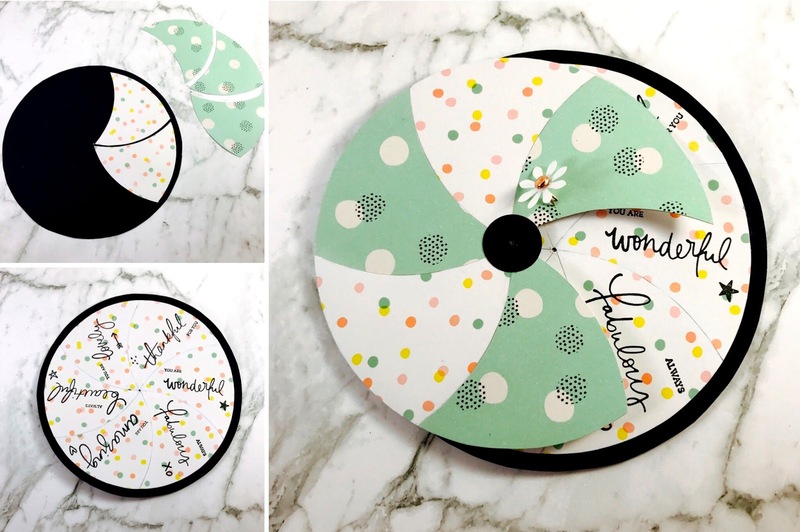 I have been a little obsessed with circles lately, here is another papercraft project of mine that was circle inspired! I hope this project inspires you to create cards that are a little different to the ordinary. Make sure to have a look at my instagram to see this spinner card in action! I hope to make a more interactive cards down the track! Happy papercrafting!